I read this story to my eight-year-old daughter and my five-year-old son who liked it well enough. 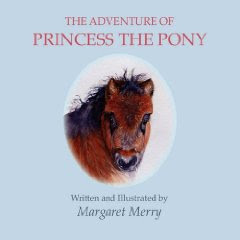 It is the story of a little pony names Princess in search of a playmate. She manages to leave her corral and meets many other animals along the way who do not treat Princess well. But an unexpected event causes Princess to gain the respect of the other horses. The watercolour illustrations done by the author are beautiful and since my son loves horses, the illustrations caught his interest. He said the author did a good job “because it’s hard to paint like that.” He especially liked Luther, the majestic black horse. Although it was an important horse, it was nice to the little foal when all the others weren’t, and my son remarked that it teaches us that we should be friendly. Both my children thought the story a little long, and were disappointed with the reaction of the little pony’s mother at the end of the story. My daughter pointed out that Luther should have told the pony’s mom what happened. My children also picked up on the fact that the mother was negative, but the little pony was positive and kept searching for a playmate even though she was shunned many times by all the animals. The mother blamed her little foal for all the troubles that happened when she herself was responsible for not watching over her little foal. However, Princess’s strong and bold personality shone through and made her endearing. It sent out the message not to give up and to keep persevering because the day would come when all your hard efforts would pay off.